As I near the end of week five of my six-week course, I am flooded with conflicting feelings. That’s typical of life in general, I guess. On the one hand, I truly can’t wait to spend a leisurely weekend with Rick, sleeping until my body decides it’s time to wake up, working in our yard, planning a great dinner in or out, either way, running errands, such simple pleasures that I have truly missed these last four weeks. Even last weekend heading out, knowing the weekend would be great fun because of the sailing trip, I still yearned to stay home. I guess that might just be the definition of lucky, right? On the other hand, I have come to feel so much for the members of the group and it makes me sad to think our time, at least in this experience, will be coming to an end. I’m sure I will share more about that in the next two weeks. But I can already feel that tightening around my heart which I recognize only too well as sorrow. I have never been good at goodbyes. 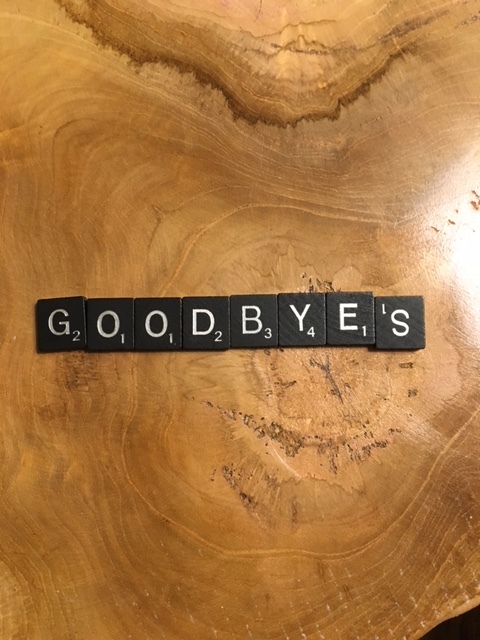 What’s good about goodbye when you love someone and will be missing their company going forward? I have no doubt that I will stay in touch with many of the members of the group, but I also know from my experiences in life that I will also lose touch with some. And that is as it should be, I know that too, but unfortunately that knowledge does not alleviate my sorrow in the moment. It never has in the past, and I have no doubt this will be any different. I’ll be crying all week. As a matter of fact, I think it’s already starting because yesterday morning when I was trying to meditate, the tears started streaming down my face thinking of one of my classmates whose child became very ill last week. I had to smile at myself, up early to start the day on a positive note, wrapped in my blanket in my favorite corner … crying, remembering how vulnerable it felt being a young parent with a sick child, and also an adult child with an elderly sick parent. Like I said, I have a feeling this is going to be an emotional week. I don’t define that as a bad week though. I think in the big picture, if we have feelings of sorrow at parting with a loved one, we have had the blessing of a special bond to begin with. There’s talk of doing our final this weekend if the class is ready for it, so that we can spend the last weekend reviewing and doing a group event on Sunday (hopefully no mountain climbing). Our final consists of teaching a 90-minute yoga routine. We are divided into two groups, and each group has about eight members, so we each take a portion of the 45 minutes. My part will be opening the first ten to twelve minutes, so I will be welcoming the “class” and introducing our theme, reading something I’ve written about our theme, teaching a chant, and leading a breathing exercise. Cross your fingers. And in case you were wondering, I never got a call back from my number last week, nor did I leave myself a message. I loved the different responses I received from you guys about who that was calling. My sister-in-law, Lorene, said she thought it was my mom. I wouldn’t put it past my mom, if she could manage it. Whenever my mom would call me, she had a way of saying my name, there was a question mark at the end of “Sue” and she held the note for a few seconds, Sueeeeeee? (Well, in print that looks more like a pig call, and even though I love pigs, that’s not how she said it.) More like Suuuuuuuu? And I always knew it would be followed with an important request like, “could you get me some more depends.” I have to admit, I thought about my mom as I stared at the phone ringing with my name on the screen. If she was trying to reach across the great divide, maybe she wanted to wish me luck on the final. I’m doubting she needs depends where she is. I hope you all enjoy your weekend. I’ll be back next week with more tales about the weekend and our final.